Former US president Bill Clinton has said the Good Friday Agreement is worth looking back at because "it shows us how we might go forward together". 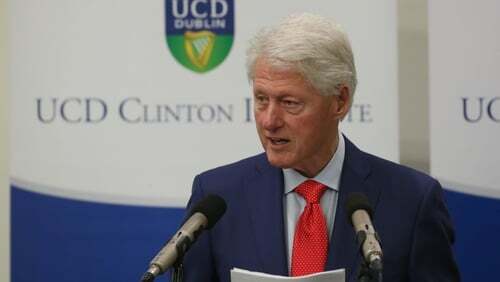 Speaking in UCD this evening, Mr Clinton recalled staying up most of the night before the agreement was signed 20 years ago tomorrow. He said that night delivered "a fine piece of work", that offers a beacon of hope both in Northern Ireland and in the wider world. Mr Clinton said the British government had traditionally wanted the US to stay out of the affairs of Northern Ireland but he "felt he should do it," to try to bring an end to the violence. He said former SDLP leader John Hume and former UUP leader David Trimble had put their political parties at risk and they did it for peace and for the young people. This shows, he said, that the agreement was "not easy" and "not free." A lot of credit too has to go to former British prime minister John Major who risked a narrow parliamentary majority to start the peace process, he said. "We should be very grateful that the peace has held," Mr Clinton told a packed lecture hall. Mr Clinton said the most important thing is that the peace held and no one has questioned democracy. However, referring to the political stalemate in Northern Ireland, he said there is a limit to political paralysis. He warned that three things could happen in Northern Ireland, there could be a return to violence; a continued purgatory of nothing happening that will damage democracy; a return to shared government. Mr Clinton said that compromise must stop being a dirty word and voters will have to stop punishing politicians who make compromises and start rewarding them. "The world was waiting to see honourable comprise unfold in Ireland again," he said. Earlier, former US Senator George Mitchell called on the political leaders in Northern Ireland to rekindle the spirit of 1998, the year Mr Mitchell chaired the talks that led to the Good Friday Agreement. Speaking on the eve of the anniversary of the signing of the agreement, Mr Mitchell said it does not in of itself guarantee peace, political stability or reconciliation. He said the challenge was to move forward and to prepare society in Northern Ireland for the challenges of the 21st Century. However, he said all western societies face some form of dysfunction and what is happening in Northern Ireland is not surprising. Mr Mitchell said he has no sense that peace is being taken for granted in Northern Ireland. He was speaking at the Hugh Lane Gallery in Dublin where he viewed a "visual record" of the events leading up to the Good Friday Agreement.